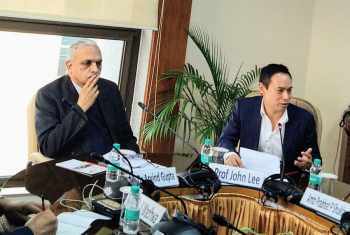 The Vivekananda International Foundation (VIF) hosted Prof. John Lee of the Hudson Institute, Washington, who spoke on ‘Responding to China's Foreign Policy under Xi Jinping’. Dr Arvind Gupta delivered the opening remarks. Prof. Lee gave a broad view of the Chinese Foreign Policy under Xi Jinping. He argued that the fundamental objectives of Chinese Foreign Policy have not changed over the years. Nevertheless, there have been certain modifications in foreign policy. China was and is looking for regional pre-eminence and in due course wants to loosen the US alliances in the region. It realises that the US is a distant power for the region. Hence, it can project its power through its alliances. In order to balance the US, China should therefore adopt coercive as well as persuasive approaches to weaken the American security posture rather than going to war. Under Xi Jinping, China wants to dictate terms and conditions in the seas within the ‘First Island Chain’, and effect ‘sea denial’ to any other power. Prior to Xi Jinping era, the priority was just the Navy but the ambit of sea-denial has broadened in the recent years. He argued that prior to Xi, China wanted to benefit from the regional and global economic systems but now it wants to leverage these system by binding the wider region to its economy and wants to dominate the economic front. Hence, they have started the ‘Belt and Road Initiative (BRI)’ and the ‘Made in China 2025’. China has always tried to deflect any criticism about its political system but under Xi Jinping, they have gone a step further. As China gives economic assistance to the smaller countries, it also tries to promote its authoritarian system and structures, e.g. Cambodia and Laos. With respect to the Belt and Road Initiative (BRI) in Central Asia and Bay of Bengal, Prof Lee explained that when China talks about infrastructure, it just does not merely imply rails, roads and other. It encapsulates the entire supply chain. The Central Asian and some of the Bay of Bengal countries are not integrated into the supply chains of the world. Thus through the BRI initiatives, China is trying to create new institutions in the region and even between countries and companies. It is trying to create an alternative system that will be shaped by Beijing itself. It encompasses hard and soft institutions integrated into a closed system modelled on the ‘Apple system’ and progressing in an insidious way. Drawing from his experience, the Prof. illustrated that China has tried hard to persuade Australia to be its ally and that it was critical for Australia to establish itself as an ‘anchor point’. In 2015, China tried to persuade Canberra to renegotiate its status vis-a-vis the US. China was constantly trying to weaken the element of alignment with the US. Australia, however, moved away from hedging to countering or balancing strategy against China. They did it explicitly for strategic reasons. It was important for Australia to make clear that it was vital for them to get its alliance structure clear with the US. Prof. Lee highlighted that China is trying to popularise two narratives: first, that it already dominates the world economically and its preeminence is inevitable; and second, it does not have to be more powerful than the US - all China has to do is to inflict a cost on the US, either military or economic. Once China can impose prohibitive costs on the US, they can tell that the Americans will never entertain any response if there is an anomaly in the region. This is the first step. Even if the US does not leave the region this will still create space for China. The other message China is trying to spread, in the on-going bilateral trade war between US and China that other countries should stay out of it. Although China claims to be the highest investor in most of the countries but it is not so. On the contrary, it is the US which is the highest investor in much of the region. Additionally, the US is a far more important centre for the region. China cannot even dominate the Indo-Pacific economies nor can it dominate the Eurasian region. China is playing to a certain extent a ‘game of bluff ‘by creating a narrative that it is going to dominate vis–a-vis the Belt and Road, he argued. In conclusion, the speaker mentioned that there was a need to create an alternative narrative to counter the Chinese storyline. The regional countries should acknowledge the fact that there is no cost- free outcome and they cannot afford to be on the sidelines anymore. They should take sides on the merit of the principles and not on the issues. At present, the pressure is on the US and other regional countries for coming together in a grand coalition. There is a marked change in the US government’s approach. Under George W. Bush Jr, the US-China relations was marked by strategic competition. Under Barak Obama, the US was not prepared to counter China but with Donald Trump, the US is prepared to take the risk. Hence China is under pressure and US-China relations are going through a tough phase. On the issue of centrality of ASEAN, the future depends on ASEAN countries themselves. If they consider themselves to be an organisation of individual countries or decide to sit on the fence then the centrality of the ASEAN will be lost. The pertinent issue here is if the US loses interest in the organisation it might stop engaging it. In the Central Asian region, if China will be able to dominate economically and that will translate into political influence. Additionally, if the developments in the western boundary of China become complicated then the Central Asian Region inadvertently becomes important for China. On QUAD, the Prof. said that China was paranoid about the concept. China has a perception that it is a way of other countries to help India. UIHC Lecture Series, ‘Debates on Ancient India’ by Prof.
© 2018 Vivekananda International Foundation. All rights reserved.